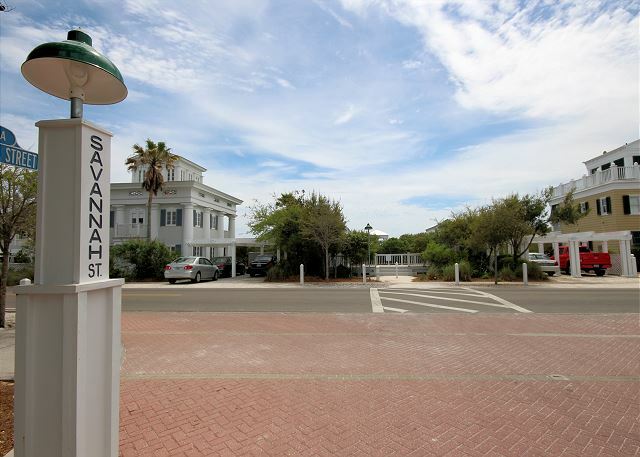 Fair Winds will cool you as you sit on the screened porch just steps from the beach entrance. This classic beach cottage, previously named Sonshine Blessings, sits on a desirable corner lot, directly across from the Savannah Street beach pavilion and two short blocks from the shops and restaurants of Central Square. Freshly painted in cool beach blues and greens, Fair Winds has plenty of room for six guests. On entering Fair Winds, you’re greeted with a corner dining space with a large table that will seat the whole family. The large open family room has a vaulted ceiling, cooled by ceiling fans. The turquoise-tiled cook’s kitchen is well-equipped with everything you need to cook and serve full meals, and a breakfast bar offers additional seating. When you don’t feel like cooking, barbecue your family’s favorites on the charcoal grill in the front yard. After dinner, enjoy a movie on the flat-screen TV, or choose from a large selection of books and board games to entertain the whole family. Down a short hallway, you’ll find the king master bedroom with soothing beach themed quilt and artwork and a mounted flat screen TV. The attached master bath offers granite tile, a full shower/bath, and a large mirrored closet. The guest bedroom has a double bed and a large built-in closet. There is a second bath in the hall with custom tile work and a walk-in shower. A second-floor loft with two twin beds provides additional sleeping space, with a door to the room to allow some privacy. The loft also offers a private balcony with a sweeping view of the Gulf waters. Outside Fair Winds, you'll enjoy a wrap-around screened porch with a dining table for six, several chairs and a swing, and beautiful landscaping that offers both shade and privacy. A variety of beach chairs and toys provide everything you need for a day on the sparkling white sand, and an outdoor hot-and-cold shower enclosure allows you to wash off the beach sand at the end of the day. A one-bedroom guest cottage, Following Seas (rents separately VRBO 219335), provides additional space for two more guests for larger family gatherings.